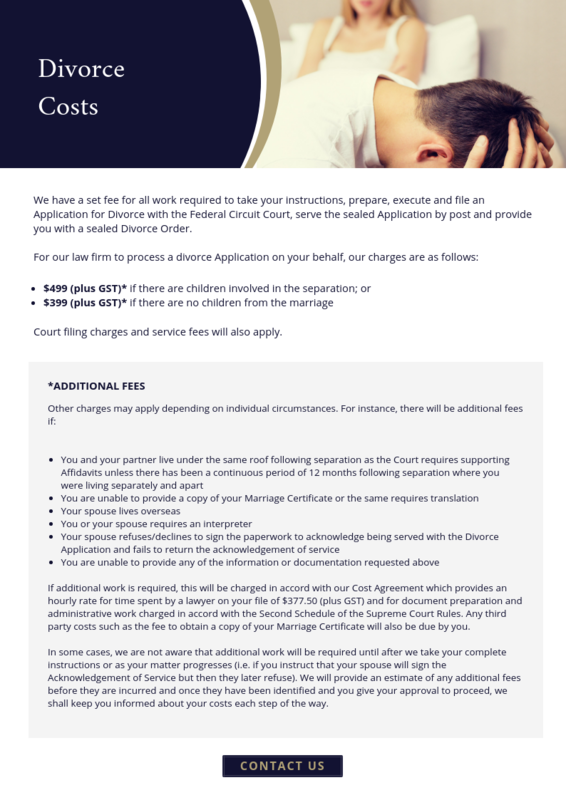 Are you are seeking a cost-effective, time-saving and hassle-free divorce? If so, we can assist you. Our specialist divorce lawyers at Armour Allen Lawyers in Adelaide understand the stresses and implications that are associated with relationship breakdowns arising from a divorce or separation. Our divorce lawyers can assist you in obtaining your divorce in a cost-effective and timely matter. With over 40 years experience, we have the necessary skills and expertise to handle any major or minor cases relating to relationships conflicts. Can I apply for divorce? In order to bring an application for a divorce, your marriage must have irretrievably broken down which is demonstrated by you and your spouse living separately and apart for a period of at least 12 months. You were separated but living under the same roof for some or all of the 12 month period. You and your spouse have attempted reconciliation and lived together for a short time but have had several periods of separation amounting to 12 months in total. There is no requirement for any party to be ‘at fault’ to obtain a divorce. The Court must only be satisfied that you were married and that you were subsequently separated for 12 months. There is a requirement on parties who have been married for less than two years to undergo counseling to discuss reconciliation before a divorce will be granted. It is possible to request permission from the Court to bring the application for divorce without complying with the counseling requirement, for example where parties live far apart or there has been domestic violence. If you have children, the Court will want to know what arrangements you have made for the ongoing care of the children before granting your divorce. This information forms part of the application submitted to the Court. You or your solicitor on your behalf, may be required to attend the Court hearing if you have children under the age of 18; however attendance is not required if you make a joint application with your estranged spouse. Attendance can be by telephone if you are unable to physically attend the hearing and have not engaged a solicitor to do so on your behalf. You do not need to be divorced to apply for a property settlement. However, you must commence Court proceedings for property settlement within 12 months of your divorce taking effect if you have not already resolved your division of property. What if my spouse opposes the divorce? If the Court does not have jurisdiction to hear the application. Our experienced divorce lawyers can provide assistance with all aspects of your divorce, including completion of the application and any supporting affidavit, serving the application on your spouse and attending the Court hearing (if required). If the Court is satisfied that you meet the criteria for a divorce (and provided that there is no subsequent appeal of the decision), the divorce will be granted and will take effect after the expiration of one month from the date of the hearing. After that time you are free to remarry. We have a set fee for all work required to take your instructions, prepare, execute and file an Application for Divorce with the Federal Circuit Court, serve the sealed Application by post and provide you with a sealed Divorce Order. $399 (plus GST)* if there are no children from the marriage. Court filing charges and service fees will also apply. Click here to view full details of additional costs. For more information regarding divorce or to discuss next steps, please contact our office. We offer a first free interview at no cost and no obligation.